DOHA, Qatar – The first Qatar Airways non-stop flight from Doha to Skopje touched down today at Alexander the Great Airport. The new route to the capital of the Republic of Macedonia will be served four times per week with an Airbus A320 aircraft, featuring 12 seats in Business Class and 120 seats in Economy Class. Skopje provides a gateway to a country of dramatic scenery, including beautiful lakes, mountains, and charming historic towns. Visitors to Skopje can discover Ottoman-era neighbourhoods, shop in the old bazaar, or visit the lakeside city of Orchid and its picturesque castle. Passengers who would like to experience the unique cultural and cosmopolitan mix of the city can book their tickets on the newly-designed Qatar Airways website or mobile application. Qatar Airways Chief Commercial Officer, Mr. Ehab Amin, who travelled on board the inaugural flight with Macedonian Ambassador to Qatar, H.E. Mrs. Vukica Krtolica Popovska, was greeted by Macedonia’s Minister of Transport and Communications, Mr. Goran Sugareski; General Manager of Airport TAV Macedonia, Mr. Alp Er Tunga Ersoy; and Qatari Ambassador to Skopje, H.E. Mr. Hassan Bin Abdullah Zaid Al Mahmoud, at Alexander the Great Airport, Skopje. The VIP delegates from Doha were offered salt and bread, a traditional Macedonian welcome, as they disembarked the aircraft. Macedonia is a centre for metal-processing, chemical, timber, textile, leather and printing industries, and is ranked as one of the Top 10 economies in the world for doing business. The launch of the award-winning airline’s new route to Skopje will help Macedonian businesspeople connect with their business partners in more than 150 destinations around the world. In addition, the commencement of air cargo service to Skopje by Qatar Airways Cargo will promote air trade growth in the Republic of Macedonia by connecting the country with its major importers in northeast Asia via the airline’s state-of-the-art Doha hub. The cargo carrier’s newly-launched Climate Control Centre enhances its seamless cool chain solutions and offers perfect transit services to support the exports of fruits and fresh produce out of Skopje to various destinations across its global network. The airline’s first ever-service to the Republic of Macedonia will also give leisure passengers easier access to Australia, where more than 200,000 Macedonian Australians live. 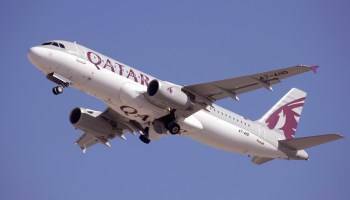 Qatar Airways is expediting its expansion in Eastern Europe, with service to Prague, Czech Republic and Kyiv, Ukraine set to commence by end of August. Qatar Airways, the national carrier of the State of Qatar, is one of the fastest-growing airlines operating one of the youngest fleets in the world. Now in its 20th year of operations, Qatar Airways has a modern fleet of 200 aircraft flying to business and leisure destinations across six continents.